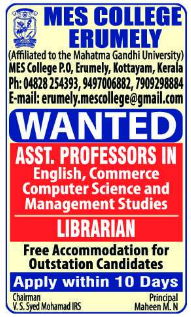 MES College, Kottayam has advertised in THE HINDU newspaper for recruitment of Assistant Professor / Librarian jobs vacancies. Interested and eligible job aspirants are requested to apply within 10 days fro,m 17th April 2019. Check out further more details below. About College: MES College Erumely is the first grade unaided Arts and Science college under the Muslim Educational Society and is affiliated to Mahatma Gandhi University Kottayam. MES College Erumely is an ISO 9001-2008 Certified Institution. The keynote objective of this Institution is to impart job oriented degree courses to the students in the socially and economically backward areas around Erumely so as to enable them to cope up with the scientific and technological advancement of contemporary society.